Imagine a place in the real world where imaginary friends are created. Or are imaginary friends created in an imaginary world? Hmm. Imaginary friends waiting to be imagined by a real child. What a wonderful concept. So if the imaginary friend is not imagined by a real child does it stay imaginary? Beekle thinks not. The other friends get imagined (accepted), but no one comes for him. 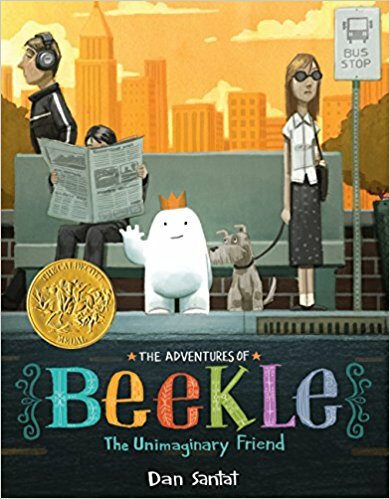 Pudgy, marshmallow-shaped Beekle waits, and waits, thinking of reasons why HE was not imagined by a real child. Until one day "he did the unimaginable." Like Max, in Where The Wild things Are, he leaves the security of his home, setting forth on the stormy seas, the dragon-infected waters. "Thinking about his friend gave him the courage to journey on…until he reached the real world." Does he find the friend? Dan Santat is a master storyteller, and there are a few more twists and turns yet. Such biting satire in his view of the adult world. "No kids were eating cake. No one stopped to hear the music. And everyone needed naptime." The accompanying images perfectly complement the words; the image of nap time is adults snoozing in the train! Poor adults. He wanders around till he sees something familiar. A dragon tail catches his eye, and that leads him to a school playground. And there, finally, he finds the friend he had been searching for. Or, the friend from the real world finds her imaginary friend. Look back dear reader to where Beekle leaves. "he did the unimaginable." And now? "And together they did the unimaginable." Alone. Together. Adults may find the movement between imaginary and unimaginary confusing, but the book will be a surefire hit with the young readers it was intended for. A perfect parable of acceptance.